Precious corals, like this species of Hemicorallium, were common during 2017 exploration of Carondelet Reef within the Phoenix Islands Protected Area on NOAA Ship Okeanos Explorer. 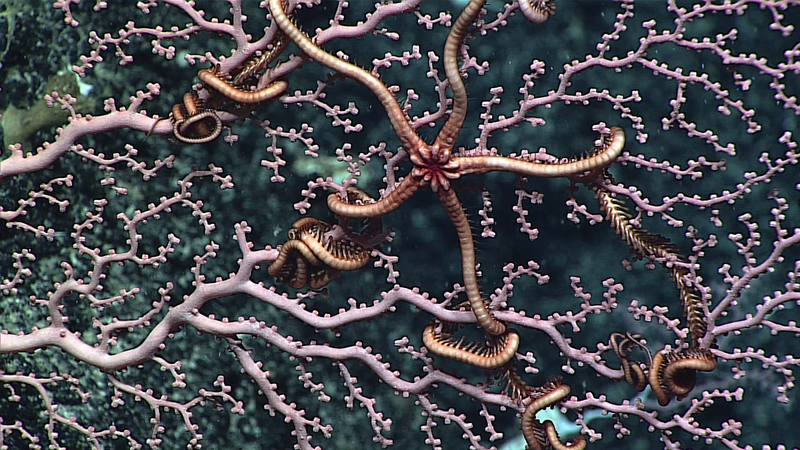 Image courtesy of the NOAA Office of Ocean Exploration and Research, Discovering the Deep: Exploring Remote Pacific MPAs. Download larger version (jpg, 1.5 MB). The goal of this expedition is to provide our first glimpse of the deepwater communities within the largest and deepest UNESCO World Heritage Site on Earth, the Phoenix Islands Protected Area (PIPA) . This work will be conducted during a 30-day cruise on the Schmidt Ocean Institute ’s Research Vessel Falkor using the remotely operated vehicle (ROV) SuBastian. It follows closely behind an exploratory cruise on NOAA Ship Okeanos Explorer, which occurred in March 2017 and involved conducting mapping and the first-ever exploratory deep dives in the region. Establishing baseline assessments of deep-sea coral biodiversity and distribution, along with the diversity, frequency, and fidelity of coral-associated communities are critical to evaluate the impact of the marine protected area on deep-sea ecosystems over time. We will examine the relationships between the deep-sea corals and the species that live with them and on them to probe the nature of their association: Are they helping the corals, or are they harming them? We will also be developing new sampling tools for corals as well as deep-sea imaging and lighting technology to elucidate the role of biofluorescence in deep-coral ecosystems. In addition, the first data on the deepwater carbonate systems of the central Pacific will be gathered to set a baseline for ocean acidification in the region. All of our findings will be communicated to the public through the use of telepresence technology to live stream the video and discoveries in real time. 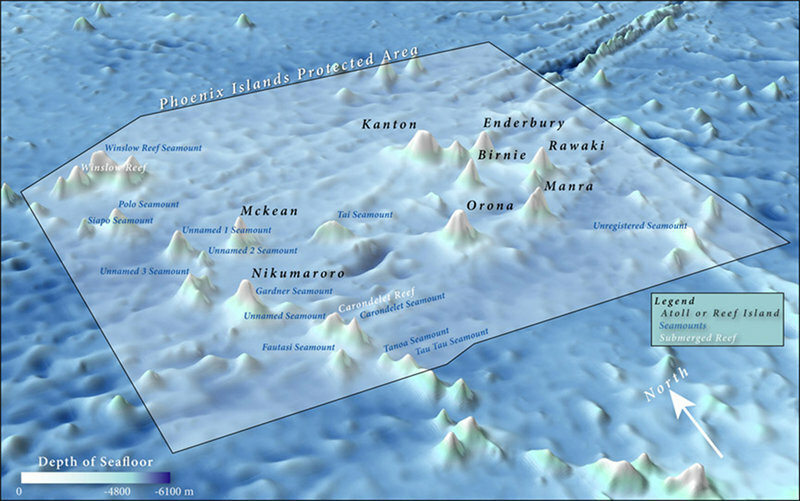 Bathymetric map detailing the seamounts and submerged reefs located within the Phoenix Islands Protected Area. Image courtesy of Kerry Lagueux / Anderson Cabot Center for Ocean Life, New England Aquarium. Download larger version (jpg, 291 KB). The islands and seamounts on which we plan to focus our exploration lie among the Phoenix Islands group, with additional dives on the seamounts of the Tokelau Ridge. Rising from an average depth of 4,500 meters and a maximum depth of 6,147 meters, a dozen of these massive volcanoes host shallow reefs and the highest peaks reach the surface, capped by low elevation islands and atolls. Four are topped by true coral atolls (Orona, Manra, Kanton, and Nikumaroro); six present as low reef islands (Birnie, Rawaki, McKean, and Enderbury in Kiribati; Baker and Howland in U.S. territory); and two are shallow submerged reefs (Carondelet and Winslow). These volcanoes represent only the highest of numerous large and long-extinct volcanoes. Most of the large volcanoes in the region are greater than 200 meters below the surface and are therefore technically classified as seamounts. The catalogued seamounts include Fautasi, Siapo, Polo, Tai, Tanoa, Tau Tau, Gardner, and four unnamed seamounts. We plan on 24-48 hour surveys (making one to two dives) on each of the six to seven seamounts along the ridge and in the cluster. These exploratory surveys and collections of fauna will serve as a critical baseline survey to gauge the impacts of future activities in the region, including fishing in the areas outside of PIPA, the continuing influence of ocean change (warming, ocean acidification, and deoxygenation), and the potential future impacts of deep-sea mining on these cobalt-rich seamounts. This is surely only a critical first step at the beginning of a long deep-sea research program in PIPA. NOAA’s Office of Ocean Exploration and Research contributed funding for this expedition via its Federal Funding Opportunity for Ocean Exploration.